How to Peel a Hard Boiled Egg | Eat This! Knowing how to peel a boiled egg may seem basic, but there are a few steps that can be followed to make the process easier and to help you avoid the headache of an egg that is tough to peel. Sometimes, it can be difficult to peel the egg because the shell may stick to the egg white. Here are some tips on how to peel a hard boiled egg. 1. When you boil the eggs, put a little salt in the water to help with the peeling process. 2. Allow the eggs to cool completely before peeling. 3. Hold the egg in the middle, and crack both ends (one at a time) on a hard surface such as the counter or a plate. Be sure to crush the air bubble that will be present at one end of the egg. 4. Lay the egg down on the counter and place your palm flat on the egg. Pressing firmly with your hand, roll the egg one revolution. 5. Finally, put the egg into a bowl of warm water and submerge it completely. The shell will easily slip off. Rinse the egg under fresh water and enjoy! Note: Keep in mind that eggs that are a few days old are better to hard boil because they will peel more easily. 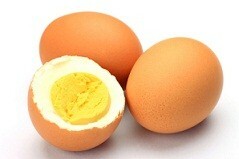 If you are using farm fresh eggs, let them sit in the fridge for a few days before you boil them.